The recount at Berlin Town Hall on Tuesday. 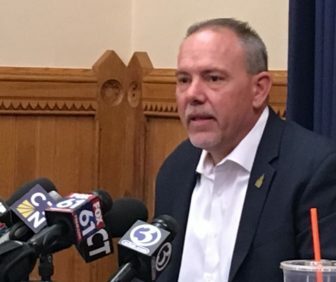 A recount Tuesday confirmed the re-election of House Speaker Joe Aresimowicz, D-Berlin, saving Democrats from a high-profile loss amid the party’s strong gains at the General Assembly. With Democrats expanding their narrow majority, Aresimowicz was set for a final two-year term as speaker — assuming the voters of the 30th House District in Berlin and a portion of Southington returned him to the House. An election-night plurality of 37 grew to 50 after the recount, giving him a 5,898 to 5,848 win over Republican Michael Gagliardi. He was a late replacement for 22-year-old Steve Baleshki, who quit the race last month under pressure from Republicans over what they called an unacceptable tendency toward intemperate or hateful comments. In less than three weeks of campaigning, Gagliardi won 49.78 percent of the vote against a six-term incumbent who holds one of the most powerful positions in Hartford. With his district tilting Republican, Aresimowicz already had decided that his campaign would be his last. Aresimowicz was the only Democrat to carry Berlin, where he is the high school football coach. Gov.-elect Ned Lamont won just 37 percent. Aresimowicz made a net gain of five votes in Berlin and 8 in Southington in the recount. His district was one of four with automatic recounts. The others were in the 17th Senate District and the 101st and 120th House Districts. A recount in the 101st House District confirmed the re-election of Rep. Noreen Kokoruda, R-Madison, though her plurality fell to 16 votes, according to the new tally in the secretary of the state’s election reporting system. She beat Democrat John-Michael Parker, 6,257 to 6,241. Democrats currently hold an 80-71 majority in the House. The Senate is tied, 18-18. 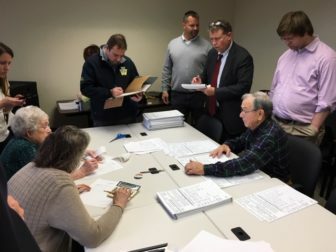 By day’s end on Tuesday, Democrats were assured of at least a 91-59 advantage in the House, with one unresolved race: The 18-vote victory by Democrat Philip Young of Stratford is subject to a recount expected to be completed Wednesday. Philip won a special election last year, flipping a GOP seat. In the Senate, Democrats won a 23-12 advantage, with one unresolved race: A recount is under way in the 63-vote victory of freshman Sen. George Logan, R-Ansonia. The new legislature takes office on Jan. 9.